Team Logo. Courtesy of @MUroller twitter account. 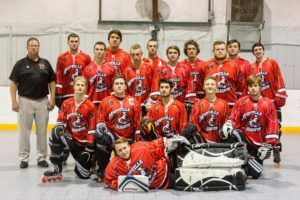 Ranked first in the Great Plains League, the Maryville Men’s Inline Hockey team, has secured their bid for the national tournament in April. The team continues to gain notoriety throughout the National Collegiate Roller Hockey Association. Prior to meeting the Maryville Saints Jan. 26, Kansas State had been undefeated. In an epic game, Maryville prevailed and brought home a 5-3 win. Maryville forward, Eddie Wright, and defensemen, Bryant Webster, enjoyed this win as they came out on top against some of Kansas State’s top players, which happened to be some of their friends. Wright is currently a junior in the Sports Business Management program from Brentwood, MO, while Webster is from Imperial, MO and is a graduate student working toward getting his Masters in Business Administration. Both play a lot of hockey in their free time and work at Abstrakt Marketing, an internship on campus. The two joined the inline team as there was not originally an ice hockey team to join at Maryville when they first started. When asked about the strengths of the hockey team, both Eddie and Bryant agreed that their camaraderie and brotherhood stand out and are the biggest motivating factors for the team. Wright and Webster offered the idea of a competition between the Maryville Inline Hockey team and the Ice hockey team. They explained how their team would like to challenge the ice team to a match for charity, on ice. To follow the team throughout the rest of their season be sure to follow them on twitter, and check out their upcoming games. Inline Hockey Team Picture. Photo Courtesy of @MUroller twitter account.